Fast and fabulous, prepped and served within 15 minutes, Tuesday night supper (or any other night of the week!) doesn’t get much better than this: olives to nibble while preparing, good bread to serve alongside and a glass or two of the doctor’s medicine (Rioja) to wash it down. It’s like bringing Spain to your place. 1 Prick the rounded part of each egg with a dressmaking pin to make a small pinhole for the air to escape (it stops the shells cracking). Carefully lower eggs into a saucepan of gently boiling water. Cook gently for 7 minutes, lowering the heat if it starts bubbling fiercely. Drain eggs and let the cold tap run over them until they feel cool. Peel, then keep eggs in cold water until everything is ready. 2 Plunge asparagus into a saucepan of boiling, lightly salted water and cook for 2-5 minutes, depending on the thickness and how you like them cooked. Drain and refresh with cold water. Dry off on paper towels. 3 Heat 1 tablespoon oil in a medium-sized frying pan over medium heat and add the chorizo. Lightly brown on both sides – take care not to let it burn – then transfer to a plate. If there is a lot of fat left in the pan, pour most of it off – you need roughly 1½ tablespoons, (or pour it all off and add 1½ tablespoons fresh oil). Add the onion. Cook gently until tender and lightly coloured, about 10 minutes, stirring often. Transfer to plate with chorizo. 4 If the pan is dry, add a splash of oil. Add asparagus to pan with lemon zest, half the parsley, a few pinches of salt and most of the paprika. Toss gently and let everything heat through. Dish onto plates along with the chorizo and onion. Remove eggs from water and pat dry with paper towels. Cut eggs in half and arrange on plates. Finish off with a dusting of paprika and a good smattering of parsley. Serve immediately. It’s nigh on impossible to peel boiled eggs if the eggs are very fresh. Start with eggs that are at least 5 days old; eggs around 10 days old are perfect for hard-boiling (also known as hard-cooked eggs). READ MORE HERE (Hard-boiled eggs). Make a vegetarian version by omitting the chorizo. Follow the recipe as described, but cook the onion gently in 1½ tablespoons olive oil in a small frying pan until tender and lightly coloured. Asparagus out of season? 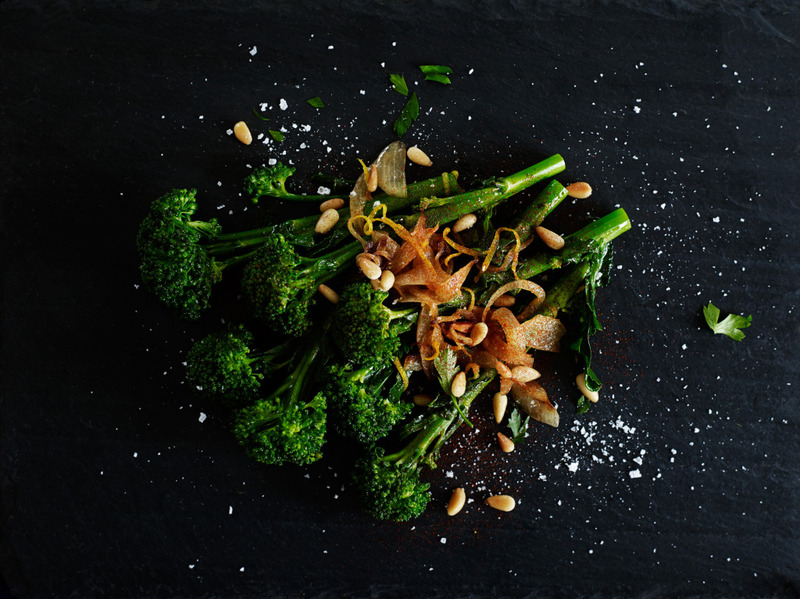 Use broccoli or Broccolini (a hybrid of broccoli and kai-lan) instead, either with or without chorizo, or make a vegan version without both chorizo and eggs. Whichever way you do it, it’s pretty scrumptious! Yum! That looks absolutely delisciosa! Mmmm. 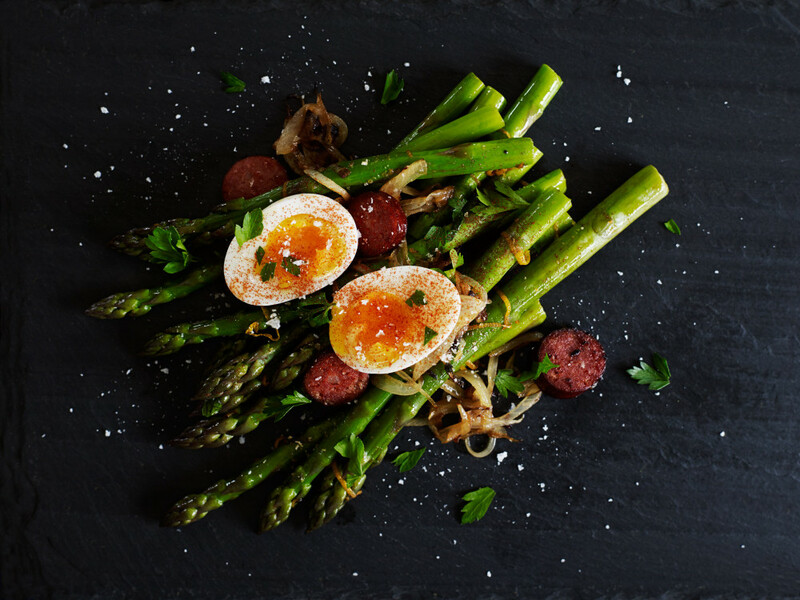 If you love eggs, and you love asparagus, it's time to dunk! Just waiting for those big mounds of asparagus to appear in shops, then you know it's fresh, plentiful and cheap!